Alun-Alun Kidul (South Square) in Jogjakarta is very lively at night. From thriller-seekers who want to test their courage by walking towards two beringin (banyan) tree with their eyes closed (it is believed that those who can pass the path inside two banyan trees have true hearts and intentions. And that their wishes would come true. Something like that.) to people who want to have a long chat with friends while enjoying dinner. 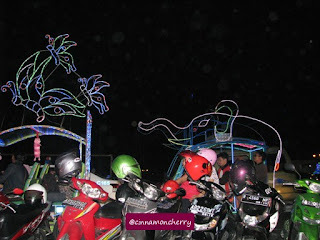 To us, Alun-Alun Kidul at night is a festivity. Plenty of colorful lights and sounds and chatters and food! 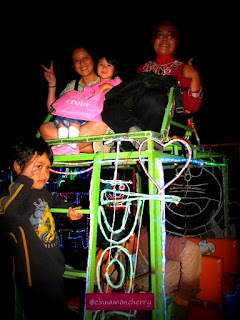 Last July, my family and I went to Alun-Alun Kidul. Labibah Zain and her kids kindly took us there. The kids were fascinated to see the colorful tandem cycle rickshaws. I don't even know what the proper name for them! Some pedal the rickshaws while others sit, admiring the scenery. I belonged to the latter category, of course. Labibah, my daughter and yours truly sat on top of the rickshaw. We hired it for one round of the square. It was quite chilly and windy and boy, the square was packed. We were not the only ones who wanted to hire colorful rickshaws! Some even have a stereo system embedded on them. Yes, and yes, it was noisy, but fun! After the ride, we went to eat. Plenty of food stalls there, selling their wares. Many seem to like Magelangan--some sort of fried rice mixed with fried noodle. A bit spicy for kids, unfortunately, so we had to order another dish for Aza. - Test your courage by trying to walk between two banyan trees! Bring something to cover your eyes. Alternatively, you can rent or buy eye cover from the peddlers. - Hire a colorful rickshaw. - Eat and drink there, lesehan style (sitting on mats). - Buy some light-copters and shoot it to the sky! Watch it float, the blinking lights will amuse you. 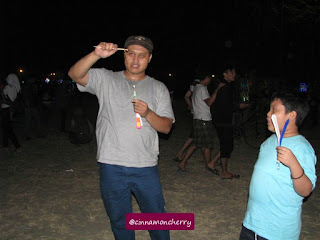 In July 2012, one costs about IDR 5,000 - 10,000.